MODERN & CLEAN STYLE: This contemporary bookcase headboard blends minimalist style and functionality in a simple and elegant piece of bedroom furniture. BEDSIDE STORAGE: Providing multiple practical and accessible storage spaces within easy reach, the bookcase headboard has fixed shelves and additional storage on one side. MODERN DESIGN: The headboard features a cable management hole in the back panel, and the side storage can be conveniently added to either the left or right of the bookcase. This tasteful headboard will help create a soothing atmosphere after a long day. With its many easy to access open storage compartments, this bookcase headboard is perfect for fulfilling bedside storage needs, keeping your reading materials and personal items organized and close at hand when you need them. A storage space accessible from the side of the headboard may be placed on either the right or left of the bed depending on your preference. This modern bookcase headboard features practical open storage spaces separated by sturdy and reliable fixed shelves, finished with a section of convenient side storage. Creating storage in an unused vertical space and a hole in the back panel allows cables to pass through for better wire management. The bookcase is easy to keep clean with a soft dry cloth. South Shore is proud to stand behind this bookcase headboard with storage with an exclusive 5-year limited guarantee. Shop with confidence knowing your purchase is always covered. All our products meets or exceeds North American safety standards and our packaging are tested and certified to reduce the risk of damage during shipment. This item is shipped in 1 box, make sure to have a friend with you. Assembly is required by 2 adults and tools are not included. If you have questions regarding this product or need assistance do not hesitate to contact South Shore Furniture 7 days support. 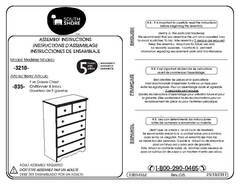 This product is made in North America with laminated particleboard. Accessories not included.